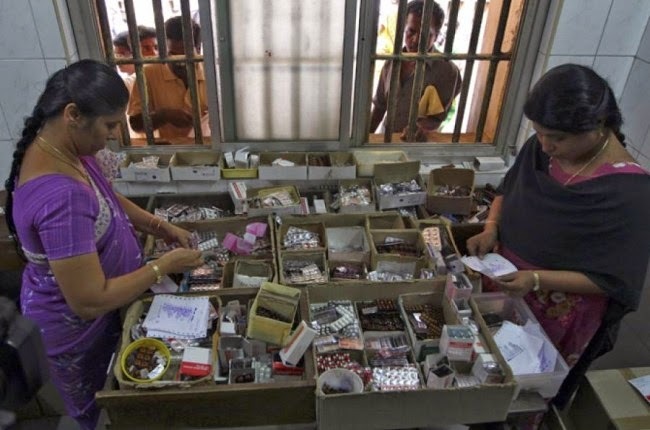 Dr.Malpani's Blog: Can free medicines really help to improve medical care ? What you are trying to say is - provide knowledge for a person who is dying of hunger ! That will never work. Only when their basic needs are satisfied poor people will heed to any teaching or preaching. Excellent example is the noon meal scheme introduced by the late Chief Minister of Tamilnadu Mr. Kamaraj. Poor children started coming to school because they got sumptuous meal in school which satisfied their hunger. Once their basic need is satisfied educating them became easier. Giving free medicines is ofcourse an excellent scheme provided it had to be implemented properly. Ofcourse corruption will be prevalent, either measures must be taken to control it with an iron hand or we must feel satisfied that atleast a bit of benefit reaches the public. Something is better than nothing ! I totally agree with you about the importance of information therapy. But this therapy will work only when poor peoples basic and immediate needs are taken care of. It is again important to make sure that common public receives the correct information and not corrupt information. You are doing a wonderful job with your blog. Keep it up ! I don't think these are mutually exclusive solutions, they are complementary. One does not replace the other. It's not expensive to provide reliable Information Therapy. This can help to keep costs down and ensure poor patients get the care they need. I don't agree that they are complementary. You have to lead the horse to water, if you can make it drink or not is a different issue. If you want to give information therapy to commoners, you have to first satisfy their basic medical needs. This will create the much needed trust too. When they don't even have money for buying medicines, why would they go to health care centers ? They will seek other forms of traditional healing practices which needs no expensive treatment or therapies. I think information about health and illness is a basic medical need.